Welcome to the Tarlton Cabinet Shop! Started in 1963 by Brady Tarlton, the Tarlton Cabinet Shop has been a one man cabinet shop providing high quality custom cabinetry to Charlotte and surrounding areas. Today, the tradition has continued under the ownership of Rommy Tarlton, son of Brady Tarlton. All of the cabinetry is hand crafted, maintaining a high level of craftsmanship not found in many of today's cabinet manufacturing companies. 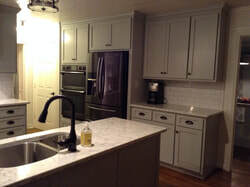 The Tarlton Cabinet Shop specializes in both residential and commercial cabinetry. Whether it is a simple remodel or high end custom home, the Tarlton Cabinet Shop is ready to serve you.